The classic symptoms of a heart attack include a pressing or squeezing pain in your chest. A heart attack occurs if blood supply to the heart is cut off. This can lead to pronounced symptoms of pain in the chest but symptoms can vary. The medical term for a heart attack is myocardial infarction (MI) or acute myocardial infarction (AMI). It is important that an ambulance is called immediately as damage to the heart muscle is more likely to occur if treatment is delayed. Note that cardiac arrest, when the heart stops beating, is different to a heart attack. A heart attack can be a cause of cardiac arrest however. 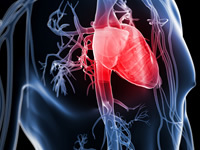 The classic symptoms of a heart attack include a pressing or squeezing pain in your chest. The pain may radiate out to your neck, jaw, arms or back. A heart attack can feel like indigestion in some people. In some cases, a heart attack can occur without you being aware of the symptoms. This is referred to as silent ischemia. If you think you are having a heart attack, or if someone else appears to be suffering from one, call 999 for an ambulance immediately. It is important that a heart attack is treated quickly as the longer treatment is delayed, the more chance that permanent damage will occur to the heart muscle. If you think you are having a heart attack, it's important to rest. If you are not allergic to aspirin, and someone can get you an aspirin, it can help to slowly chew an aspirin whilst help arrives. Common causes of heart attacks are the result of either a blood clot in the coronary arteries or a severe narrowing within the coronary artery. When a blood vessel becomes damaged, cholesterol and white blood cells form a plaque to help the blood vessel to heal but, over time, if too much plaque builds up within the blood vessel, it can cause problems such as narrowing of blood vessels and hardening of arteries. Damage to blood vessels in this way is a hallmark of heart disease. Another problem is that parts of a plaque can rapture and break off. This is problematic as it can get trapped by narrower blood vessels causing a serious blockage in the blood supply which, if it blocks blood supply to the heart muscle, can lead to a heart attack. When an ambulance comes, the paramedics may be able to diagnose whether a heart attack is occurring with an electrocardiogram (ECG). Otherwise a diagnosis can be confirmed at the hospital. The ambulance staff will be able to give aspirin, if appropriate, and will provide any pain relief that may be required. All of these cases can be treated but, in some cases, the complications of a heart attack can lead to death. Around a third of people who have a heart attack die as a result. Whilst fat has been given much of the blame for heart disease, it's important to note that a high calorie diet, regardless of the fat content, will raise the risk of heart disease and heart attacks occurring. It's useful to note that the majority of 'fatty foods' linked with a higher risk of heart disease, such as crisps, biscuits and pastries, are high in both fat and carbohydrate, making them high calorie foods. Evidence also shows that people with better controlled diabetes and a lower HbA1c can significantly reduce their risk of suffering heart attacks.